↑ "Cable: 06KIEV1663_a". Wikileaks. अभिगमन तिथि 1 मार्च 2014. ↑ "Ukraine: Speaker Oleksandr Turchynov named interim president". बीबीसी न्यूज़. 23 फ़रवरी 2014. मूल से 23 फ़रवरी 2014 को पुरालेखित. ↑ "Ukraine protests timeline". बीबीसी न्यूज़. 23 फ़रवरी 2014. मूल से 23 फ़रवरी 2014 को पुरालेखित. ↑ "Turchinov elected as speaker of Ukrainian Parliament". Voice of Russia. 22 फ़रवरी 2014. मूल से 25 फ़रवरी 2014 को पुरालेखित. ↑ "Who Is Who in Tymoshenko's Government?". Ukrayinska Pravda. 23 दिसम्बर 2007. मूल से 8 अगस्त 2007 को पुरालेखित. ↑ Byrne, Peter (10 दिसम्बर 2010). "New and conflicting details emerge over Mogilevich's alleged involvement in nation". Kyiv Post. मूल से 14 दिसम्बर 2010 को पुरालेखित. ↑ "Тимошенко и Луценко объявили Турчинова единым кандидатом от коалиции" [Tymoshenko and Lutsenko announced Turchynov the only candidate from the coalition]. Korrespondent.net (रूसी में). 22 मई 2008. मूल से 28 मई 2008 को पुरालेखित. अभिगमन तिथि 1 मार्च 2014. ↑ "Cabinet: Turchynov will fulfill premier's duties until new government is formed". Interfax-Ukraine. Kyiv Post. 4 मार्च 2010. मूल से 7 मार्च 2010 को पुरालेखित. ↑ "Ukraine's new government puts final nail in coffin of the Orange Revolution". द गार्डियन. 11 मार्च 2010. मूल से 14 मार्च 2010 को पुरालेखित. ↑ "Список депутатів нової Верховної Ради" [List of Parliament Members of the new Verkhovna Rada]. Ukrayinska Pravda (यूक्रेनियाई में). Ukraine. 11 नवम्बर 2012. मूल से 27 जनवरी 2013 को पुरालेखित. ↑ "Turchynov campaign draws scrutiny". Kyiv Post. 24 अप्रैल 2008. मूल से 30 जनवरी 2011 को पुरालेखित. ↑ "'Illusion of Fear' from Turchynov". Kyiv Post. 22 मई 2008. मूल से 25 फ़रवरी 2014 को पुरालेखित. ↑ "Ukraine submits 'Illusion' for Oscar race". Ukrainian Independent Information Agency. 16 अक्टूबर 2008. मूल से 23 फ़रवरी 2011 को पुरालेखित. 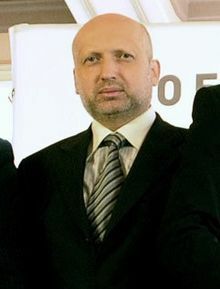 ↑ "बीबीसी न्यूज़ - Profile: Olexander Turchynov". Bbc.com. 2014-02-23. अभिगमन तिथि 2014-03-03.